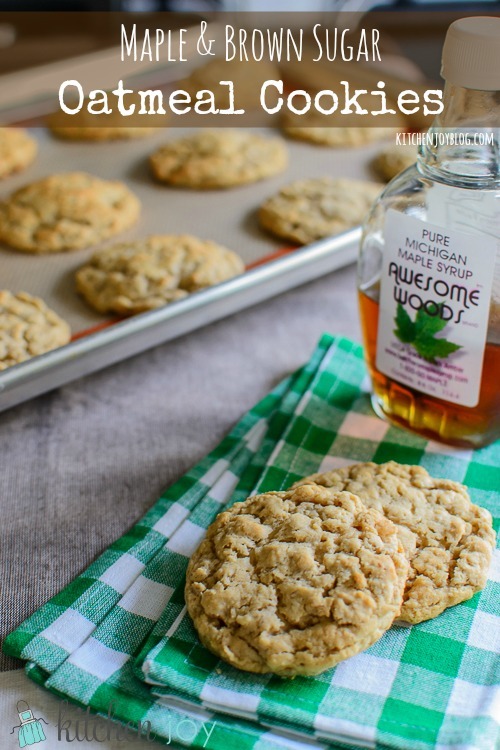 Pure maple syrup and brown sugar are the reason these chewy oatmeal cookies are packed with flavor. Not a raisin in sight! 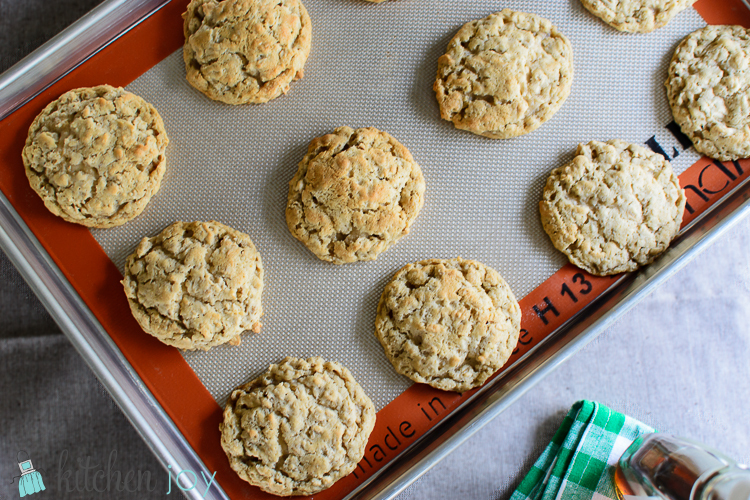 I’ve been meaning to make an oatmeal cookie recipe for a while now. It needed to meet two requirements: 1. No raisins. 2. Flavorful. 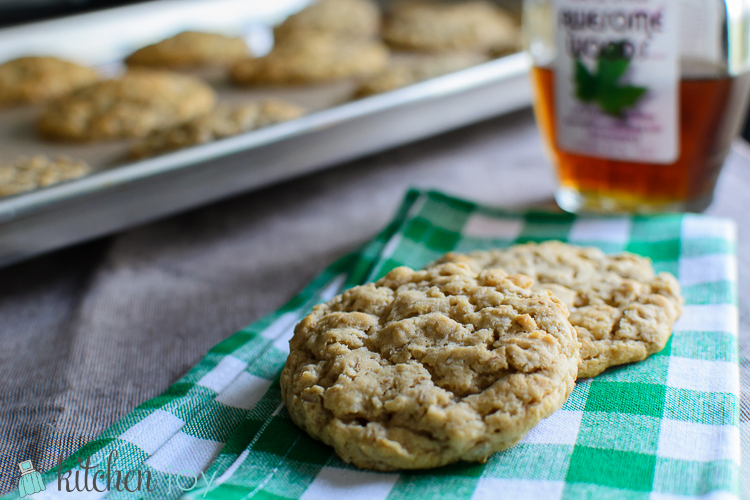 After many practices batches, I found that there are a couple of little things you can do to make your Chewy Maple Brown Sugar Oatmeal cookies the best they can be. Considering that they don’t have any chocolate chips or anything distracting from the dough, it is important to do it right so that your cookies are moist, flavorful, and hold their shape during baking. First: Use good quality, pure maple syrup. I am partial to Michigan maple syrup myself, but use whatever is available to you. I recently read somewhere that Grade B maple syrup has more intense flavor than Grade A. I haven’t tried them side by side enough to be able to attest to that claim. Might be worth it though. I typically buy Grade A. Second: Chill the dough for a minimum of two hours. This is true of most every cookie recipe, but I found that the texture of these cookies was dramatically improved when allowed to chill thoroughly in the refrigerator. Shortcutting by placing in the freezer for a while did not yield the same results, but were better than the cookies that were made with un-chilled dough. Properly chilled dough helps the cookie dough not to spread out during baking, and helps the cookies to bake really evenly and stay nice and moist. Line 2 large baking sheets with Silpat baking mats or parchment paper. In the bowl of a stand mixer, beat together the butter, shortening, brown sugar, and granulated sugar until light and fluffy. Add maple syrup, eggs, and vanilla. Mix until combined. Add baking soda, salt, and baking powder. Mix until combined. Mix in oats and flour just until combined. Be careful not to overbeat. Scoop dough 2-inches apart on prepared baking sheets. Gently press down with palm on top of each ball of dough to flatten slightly. Cover loosely with plastic wrap and refrigerate at least 2 hours, or overnight. Bake 11-14 minutes or until lightly golden, rotating halfway through. Center of cookies will still appear shiny and slightly undercooked. Let cool on baking sheet for 10 minutes before removing to wire rack to cool completely. 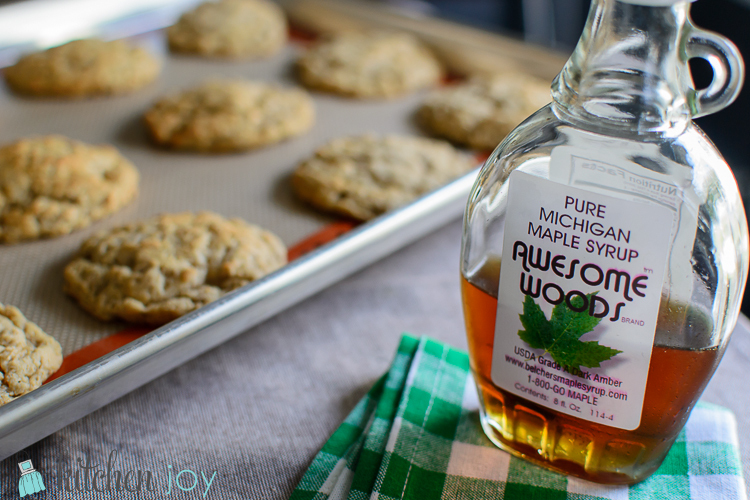 **To add even more maple flavor, substitute pure maple extract in place of the vanilla.